Heat oven to 425°F. Make pie crust mix as directed for 9-Inch Two-Crust Pie, using 1/3 cup cold water--except trim overhanging edge of bottom pastry 1 inch from rim of plate. Serve pie with warm caramel topping. It might just be the most iconic pie of all time: apple pie wears the crown as the king of Americana and the ultimate dessert to kick off the fall baking season. In this recipe, a buttery crust holds a bounty of sliced apples that add a fresh flavor no pre-made filling can match. 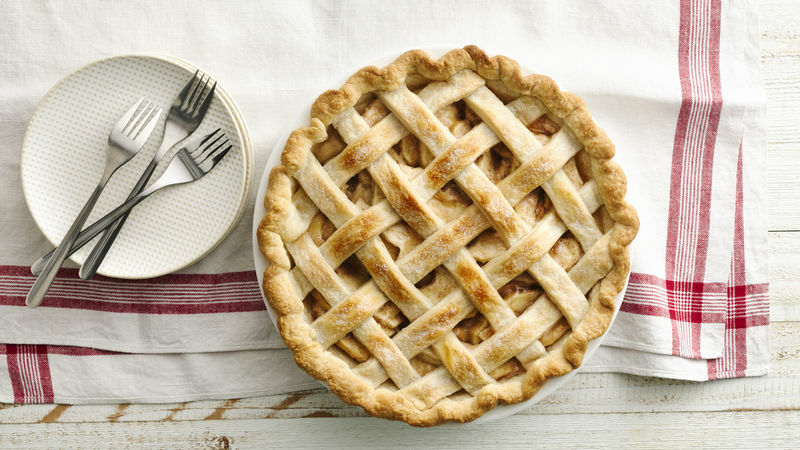 The apples are spiced with cinnamon, nutmeg and sugar for just the right note of cozy sweetness and the whole thing gets topped with a pretty and easy-to-achieve lattice crust. Even if it’s your first time making apple pie , follow our recipe and you’ll be baking a masterpiece in no time.